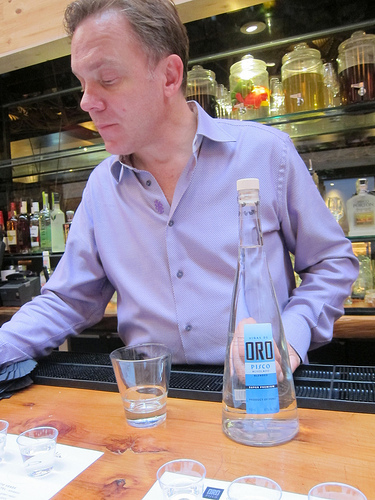 I love pisco and it was no surprise I jumped at a chance to try ORO Pisco at the newly opened Osaka Hollywood. Pisco is made from grapes and often is called the Peruvian brandy. 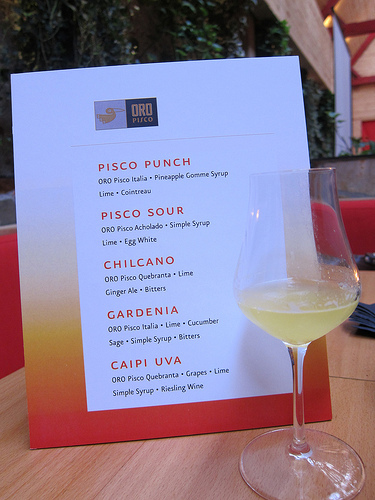 We tasted 6 of the 11 piscos offered by ORO Pisco. It’s hotly debated where pisco comes from- Peru or Chile. Well, I was first introduced to it at a tailgate thrown by Peruvians and I tend to believe them. 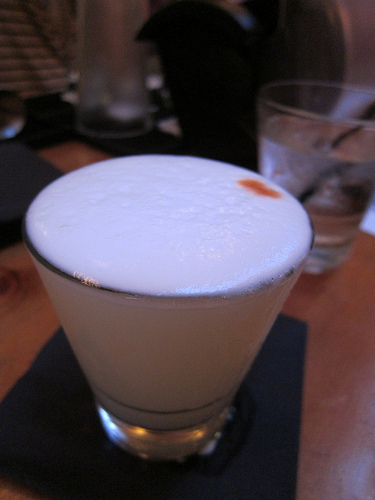 Years later, one of my favorite drinks is still a pisco sour. We were offered pisco punch and pisco sours in the beginning and then we moved onto the educational portion of the tasting. After explaining the history of pisco and its close ties to San Francisco, Timothy Childs of Clear Grape LLC which distributes ORO Pisco, invited us to make our own cocktails. Although I had tried some of the pisco sour earlier, I really wanted to make my own. Pisco is never mixed or diluted when distilled and the different designations comes from which grapes or blends are used. Starting with the “pure” piscos- Quebranta, this pisco is non-aromatic and often used for mixing. 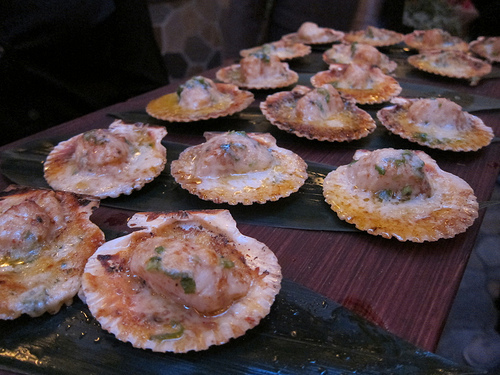 Of the aromatic piscos, we tried Italia and Torontel. We also tried the Mosto Verde (green must) piscos including a Mosto Verde Italia and Mosto Verde Torontel. Green must piscos are distilled from partially fermented must. Then there’s the blends- Acholado comes from a variety of grapes. ORO piscos lists it as a blend of Quebranta, Italia and Torontel. 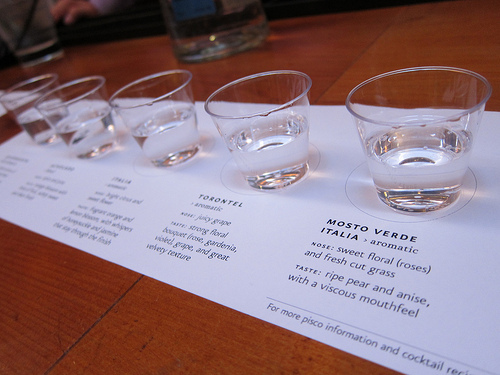 After sipping all of them, we realized that some piscos are definitely meant to be sipped, particularly the Mosto Verdes. To use it mixed would be silly. It would be like using an anejo tequila for a margarita. Save the Quebranta pisco for mixing! I offered a taste of my pisco sour to Timothy and after his first hesitant sip, he took a big gulp and pronounced it tasty. Never have I’ve been so proud of my “mixology” skills. 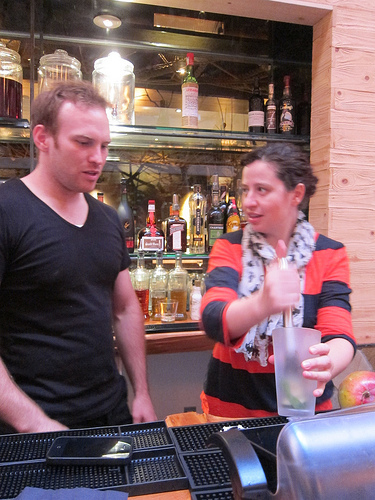 But I have to admit I had a lot of help from bartender Bruce. Pisco sours are relatively easy to make, you shake the pisco, egg white, simple syrup and lime juice (make sure it’s key lime) and then add a couple of drops of bitters. 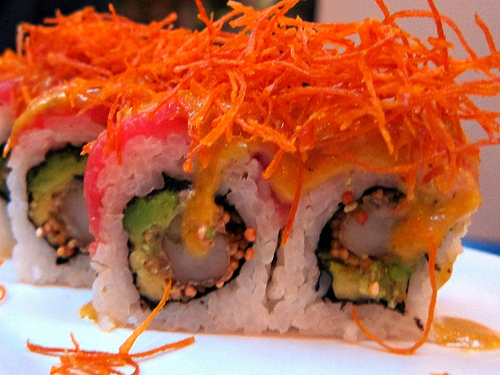 Osaka is a small chain that started in Peru. The Hollywood location is its first in the United States. 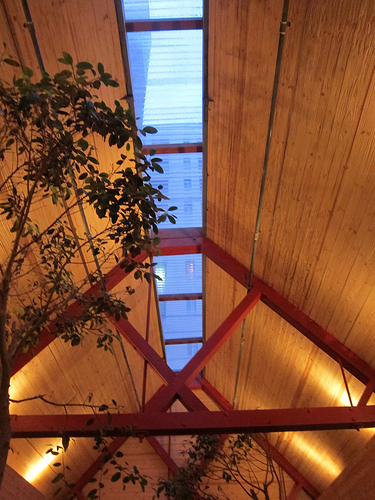 I love the ceiling at Osaka and the space in general is gorgeous. After stepping inside using the stepping stones, the tranquil space serves a mixture of Asian (particularly Japanese) and Peruvian cuisine. We tried some sushi and skewers. 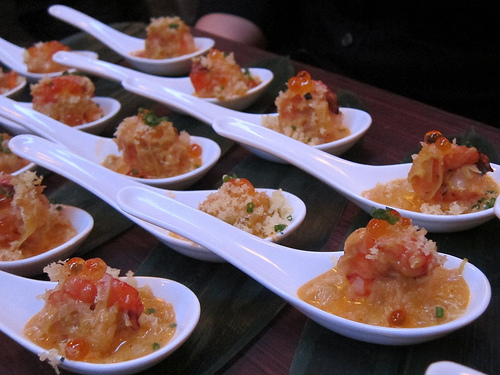 My favorite bite this evening was the shrimp with salmon roe and crispies. It was the perfect little bite. 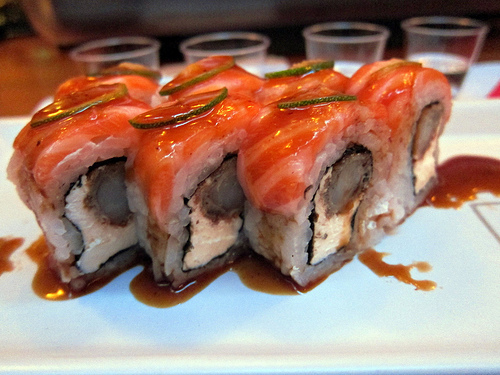 The scallops were very good as was this roll topped with salmon and thinly-sliced jalepeno. I never thought I’d like a cream cheese roll. Welcome to the neighborhood, Osaka! I’m eager to try more of Osaka’s infused piscos as well. Omg I love pisco sour and that parm scallops look so good! 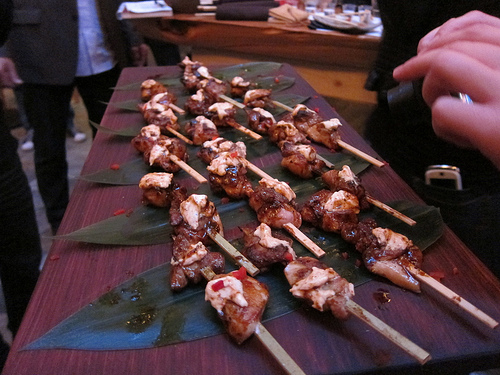 The food pairings are right on with the cocktails. Seems as though Osaka is jumping out the gate with good stuff. Perfect evening!